The Lucida Dress pattern is a really simple pattern designed to be an everyday dress. But with a few simple changes, it can easily be transformed into something more formal and elegant. Meet the Lucida Maxi! Adding a gathered panel to the hem of the Lucida Dress is super easy. The first will be a beginner class, perfect for anyone hoping to learn more about sewing with knits. We will be making the Grace Top. It will be fun and easy. Get all the details and reserve your spot here. The Joni Jumpsuit is perfect for experienced sewists and confident beginners! Make yourself a super cool Joni Jumpsuit and expand your skills when it comes to sewing with knit fabrics. Get all the details and reserve your spot here. The Square Neck Top is an easy to sew box top, designed for knit fabrics. The number one question we get is "Do you think I could make it out of a woven fabric?". Well, Ladies and Gentlemen, I'm here to tell you, YES! Yes, you can make the Square Neck Top from a woven fabric, and it looks fantastic to boot. This Square Neck Top is made it from a nice linen blend with a little drape, and a whole lotta wrinkle. On this version I decided to topstitch the facing down instead of hand tacking it. I like the added character that it gives. Once you have your pieces pinned, using some tailors chalk (or a different marking tool) measure 1" down from where the armpit ends, mark it. Repeat on front and back pieces! And that's it! Super easy! I love my woven Square Neck Top... almost more than I love the knit version... almost. These cozy plant buckets are perfect for plants of any size! You can add eyelets and convert them to hanging buckets. You could even put something besides plants in them if you want. They are not waterproof, so leave your plants in their plastic liner and take them out to be watered. We hope you enjoy this tutorial! If you share a picture of your plant bucket please tag @fridaypatterncompany and use #diyplantbucket. We love seeing your makes and looking at pictures of plants! MATERIALS: All you need is an old pair of jeans and some bias tape! 1. CUT your pants to your desired length. I find my ideal shorts length by standing up straight with my hand by my side, about halfway down my middle finger is where I want my shorts to hit. It may be different for you! I would recommend airing on the side of too long (you can always shorten them later!). 2. ROUND the edges. Starting about 1.5" up from your side seam, round the edge of your cut. 3. PIN bias tape around edge of shorts. Repeat on both legs. 4. STITCH your bias tape in place 1/8" from the edge. Make sure you're catching the tape on the underside. Repeat on other leg. Press. Trim away loose threads. 5. CUT a 2" strip of your tape. Press it open (edges still folded under). Fold over 1/2" on either side, press the corners in so that you can't see them and pin in place on your shorts (see image below). Repeat on other side. 6. STITCH your little piece of bias tape in place, enclosing the raw edges of the bias tape you sewed around the hem. Press. Trim away excess threads. 7. 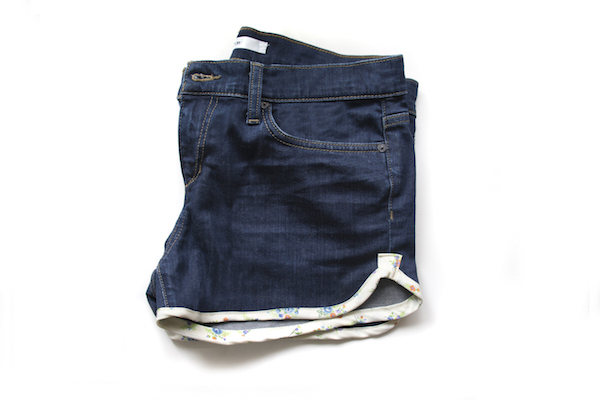 STRUT around in your super cute new shorts! Head outside for maximum enjoyment! This sweet little backpack is as easy to make as it is cute. All you need is a few supplies and some basic sewing skills. You'll make your pattern pieces based on the measurements supplied below. * Seam allowance is 5/8" and is already included in pattern pieces, unless otherwise specified. 2. Fold the Upper Strap, Fastener Strap, and both Straps in half lengthwise and press. Stitch down the length of each piece making them into tubes. 3. Turn pieces inside out and press. 4. Turn raw edge under on one edge of the Fastener Strap, stitch across. 5. MARK THE PLACEMENT FOR THE FASTENER STRAP: make a mark on the center of one of your main body pieces. Measure 5" straight up and make another mark. 6. Using the marks you made, pin the Fastener Strap to the Body, matching up the raw edges of the strap and body pieces. 7. Topstitch the Fastener Strap to Body ¼” from edge starting at the bottom, stitch 5” up, turn, stitch across, turn, and stitch ¼” from the edge all the way back down to base, securing the Lower Fastener Strap in place. 8. TRAPENTO STITCHING ON STRAPS (optional): stitch ½” from edge on strap, stitch ½” from opposite edge, stitch a 3rd time down the middle of the strap. Repeat on second strap. 9. ATTACH STRAPS TO BACK BODY PIECE: make a chalk line straight across 7" up from the bottom. Pin straps facing downward, matching raw edge with the chalk line you made, stitch across each strap. Trim away excess, flip straps upward and stitch across again, encasing the raw edges (see image below). 10. PIN STRAPS TO TOP OF BACK PIECE: the straps will be pinned at the top of the body piece. At this point you can adjust the length of the straps to what feels most comfortable for you! You can also chose how far apart (or close together) you want the straps. Just make sure they are centered! Once you have your length and placement set up, stitch across the straps at the top to hold them in place. 11. ASSEMBLE THE FLAP: (You can download the flap template here)Fold the Upper Strap in half looping in your 2 D-rings. Stitch across your folded strap to secure D-rings in place. 12. Fuse interfacing onto Flap piece. Mark the center of your flap and pin the raw edge of your folded upper strap in place, stitch across. Pin front and back flaps, right sides together, sandwiching your Upper Strap with D-rings, stitch together leaving the straight edge open. 13. Trip away excess seam allowance and turn your Flap right side out, press. 14. Mark the center of your back piece, and the center of your flap. Match these up and pin your flap to your back piece above where you secured your straps. Stitch across. 11. Pin the front and back Body Pieces, right sides together, and stitch together on 3 sides, leaving the top open. Be careful not to catch the Straps, flap, or Lower Fastener Strap. 12. CREATE BOXED CORNERS: with your backpack still inside out, mark and cut away 2" squares from the lower left and right corners. 13. Pull apart the layers of the bag at the cut corner matching the edges so that you have a straight diagonal line. Stitch across. Stitch across a second time for added strength. Repeat on both sides. 14. Stitch your front and back lining pieces together. Repeat steps 12-13. 15. With right sides together put your outer backpack inside your lining and pin together matching up raw edges around the rim. 16. Stitch around rim leaving a 4-5" opening. Pull out the body of your backpack and turn it right side out, stuff the lining back inside. Hand stitch the opening shut. 17. AND THAT'S IT! Now just fill your backpack with goodies and take off on an adventure!!! !